A developer has filed plans with the BPDA to replace an auto-repair garage and parking lot with a four-story, 38-unit residential building with 25 parking spaces at 11 Walley St. in East Boston. Read more. From the city's proposal to Amazon, based on HYM's plans. The HYM Investment Group, headed by a former BRA director, yesterday filed an initial plan for its project to turn a tired old race track on the East Boston/Revere line into a development that could ultimately include 10,000 housing units, two malls and lots of office space when completed in 15 or 20 years. Read more. 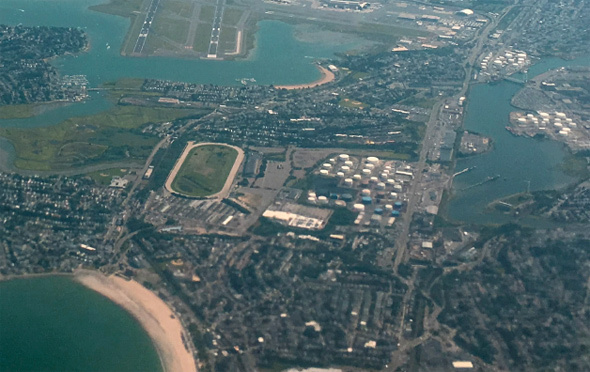 BloodHorse reports that the company that now runs Suffolk Downs - the land for which it's sold to a developer keen on attracting Amazon - is working with New England horse breeders and racers to look for a new site on which to build a replacement track. The Revere Journal reports on a meeting between the Revere city council and Tom O’Brien, whose HYM now owns the 161-acre Suffolk Downs site and who says Amazon going somewhere else wouldn't change his plans to build something like Assembly Row in Somerville, only "much better." Boston today released its bid to Amazon that calls for creation of a new Amazonian neighborhood at Suffolk Downs that would include 10,000 new housing units - some even aimed at people who don't work for the company - 1,500 hotel rooms, four new shopping districts and 40 acres of open space and the 8 million square feet of office space Amazon wants. Read more. The MBTA reports "moderate" delays due to an inbound Blue Line train at Suffolk Downs that needs to be taken out back and shot. The North End is how Suffolk Downs should be redeveloped. No parking, high lot coverage, narrow streets. Actually urban instead of the "Ye olde towne centre" fakery of Assembly Square. The new owner of the old Suffolk Downs sketches out mixed-use redevelopment plans for the site that would be modeled on the success of Assembly Row in Somerville. The State House News Service reports on the approval by the state Gaming Commission. The move clears the way for the massive redevelopment of the site on the Revere/East Boston line, although racing should continue for another year. The Supreme Judicial Court today backed letting voters decide whether a man who has an agreement to buy a mobile-home park near Suffolk Downs should be allowed to apply for a slots-parlor license for the parcel. Read more. The Globe tracks down the backer of a proposed ballot question that would allow a slots parlor on land near a racetrack - a guy who bought a mobile-home park near Suffolk Downs, which had insisted it had nothing to do with the proposal.